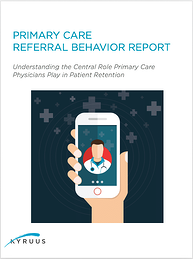 Do you know how primary care providers make decisions about specialty referrals? Patient access is a top five strategic priority for health systems across the U.S., and many organizations have researched related challenges from the perspective of patients and specialist providers. Patients find healthcare providers in a variety of ways and, for health systems, provider-to-provider referrals represent a key channel into their organizations. Our newly published Primary Care Referral Behavior Report explores patient access from the perspective of a group that has received little attention in past research, despite its central role in routing patients to providers: primary care physicians. 100 primary care physicians from private practices, hospital-owned practices, academic medical centers, community medical centers, and managed care organizations across the U.S. participated in this study and articulated how they refer patients to specialty care and how to improve that process in order to improve the patient experience, boost outcomes, and reduce patient leakage. 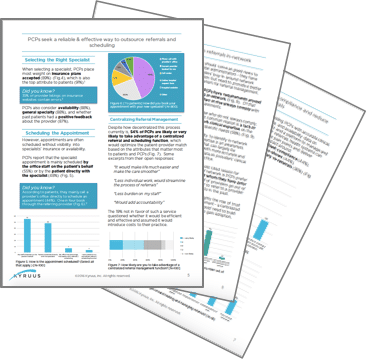 See how their insights can enhance referral management and care at your health system: download the report here.